High quality bending performance on stainless steel, and other hard tubing such as steel and titanium. Two stage design allows for in-place bending from 90 ̊ to 180 ̊ without ever crossing handles. Lock/unlock with a half turn rotation of the bending handle. 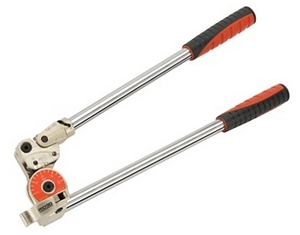 Extra long 16" (40 cm) handles increase leverage and roll dies in the bending form reduce force needed. Vise clamp built into bending form for extra stability. • Capacity (O.D.) : 1/4"
• Capacity (O.D.) : 5/16"
• Capacity (O.D.) : 3/8"
• Capacity (O.D.) : 1/2"